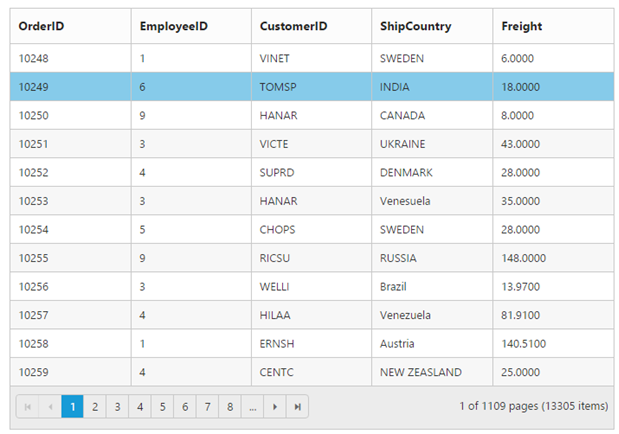 This section briefly describes how to make a connection to WCF “Northwind” OData service and generate a report with top five orders from customer HANAR with higher “Freight” charges. In this application scenario, you can learn how to do paging, filtering and sorting in DataManager using ej.Query. Create an HTML file. Add the following reference code to the required libraries. The local array is set as data source using the following code example. In this application, as you have web service for NorthWind database, you can assign the web service URL link to the URL property of ejDataManager, and you can enable crossDomain to retrieve data from another domain. You can use ej.Query to generate the report from web service. You can generate the Filter query to filter the CustomerID column based on VINET value and it is executed using the DataManager. The where function is used to filter the records based on the specified filter condition. The select property of ejQuery, is used to retrieve the specified columns from the data source. The executeQuery property is used to process the data based on the query. When you execute the filter query and binding the result to the table, the following table is displayed. You can generate the Sort query to sort the Freight column in descending order and that is executed using the DataManager. The sortBy property of ejQuery is used to sort the records based on the field and direction specified. When you execute the sort query and binding the result to the table, the following table is displayed. You can generate the Paging query to get the top four orders and it is executed using the DataManager. The page property of ejQuery is used to retrieve the records based on the given pageIndex and pageSize. When you execute the paging query and binding the result to the table, the following table is displayed. Many Syncfusion UI widgets support data binding, and the Syncfusion DataManager is an ideal binding source for both local and remote data. A DataSource can be created in-line with other Syncfusion UI widget configuration settings, as demonstrated in the example below. executeLocal method is used to get the local json array. To bind remote data to Grid Control, you can assign a service data as an instance of ej.DataManager to the dataSource property.